There is so much to love about spinning. It is more than just the creation of yarn; that is only part of the story. There are so many opportunities for memories along the way. From fiber acquisition, to the time the yarn (in whatever form it might be at that time) has completed its journey, much can happen. I remember when I bought this alpaca/silk blend. It was a few years ago at a tiny fiber festival in Tennessee. A group of us had gone up together, though I think I was the only spinner amongst us at that time. Some were there just for the trip, others were just on the lookout for bargains, I think there was a reluctant knitter, and a couple more curious about spinning. I mostly wandered on my own, finding little gems along the way, including this big bag of fluff. Then it sat and waited. I admired it, but did not think I was good enough at spinning to use it, and I wanted to wait until my spinning skills were worthy. Fast-forward to Le Tour de Fleece 2009, and I was ready to challenge myself. One day, a friend invited me to her home to spin and watch the cyclists on television. We chatted, I spun, she took pictures, and she pointed out places in France from her past. When I left, I began to formulate a plan--I wanted to turn this fluff into yarn and then knit it into something for her. I began thinking of the right pattern, and I found one I would like to knit for her. Then it was time to check the yardage, and I was short by a lot, so the yarn sat. My friend moved away, and it sat some more. 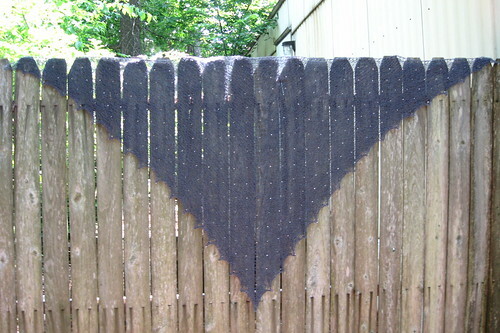 Then, there was a knitalong, and the pattern brought the alpaca/silk yarn to memory, but before starting, I checked yardage again, as I have been burned in the past. I was so pleased to see that I had enough yarn, and I began knitting Emily2. It was odd to be participating in an online knitalong while needing to keep the project private, but I was just glad to be knitting for my friend. The only stumbling block that remained was getting it in the mail, and that took months, but I finally did, and now it is with my friend. 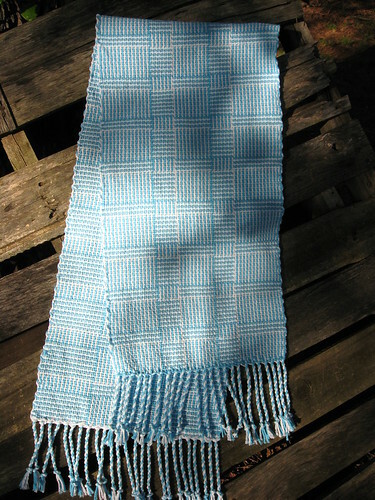 It is not as though my grandma is reading the blog, so I could have shown this gift when I finished weaving it. My selvedges still need a bit of work, but really are better than this photo shows them to be. Anyway, I finally made my way to the post office this week, so she should have it soon. Playing Tour de Fleece does cause the blog to suffer a little bit, but I am having fun. I even got my niece in on the action when she spent the night. Her first skein of yarn is drying. Clearly, I have been neglecting the laundry a bit, too, but I am caught up on washing dishes. I suggest we fast for a few days so that I might bask in the glory of my accomplishment. It is not just the Tour keeping me busy. I have also been playing with Google+. Some of you are already there. I have been sending invites when they are open. If you are not yet in, but would like to be, let me know. I am not quite sure what to make of it. Time will tell, I suppose. Today is going to be a slow day, as my fingers are achy. So much for getting caught up on blogs, eh? On Your Mark, Get Set, Spin! It is that time of year again, and I am ready for Le Tour de Fleece! Once again, I am a part of TeamCrankyPants! I love the relaxed, supportive, fun group, and pleased to be a part. 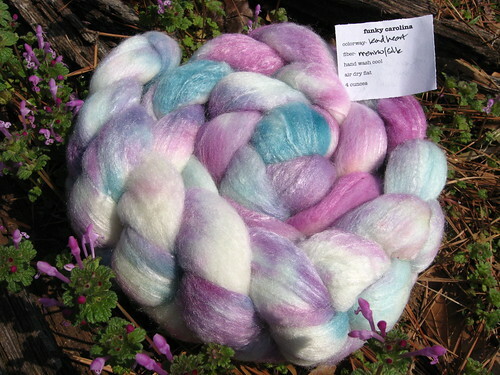 This year, I am spinning a selection from my Funky Carolina Pure Inspiration Club, the colorway is called, kind heart. This is a merino/silk blend, and is a new combo for me. I think the time is right for me to spin this very special fluff. I have a few other ideas about what I might spin this year, but for now, this is my focus.